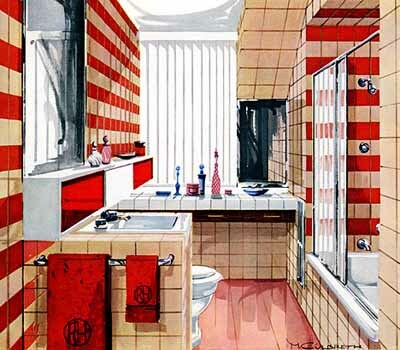 Retro bathroom decorating ideas in 1950s and 60s style feel soft, sentimental and beautiful. 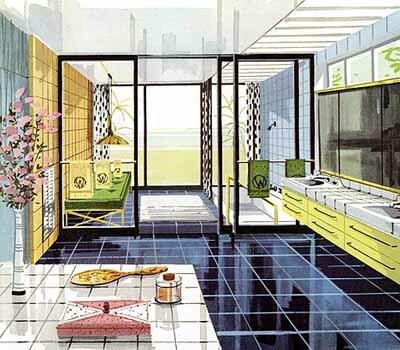 Retro bathroom decor makes modern homes look stylish, relaxing and unique. 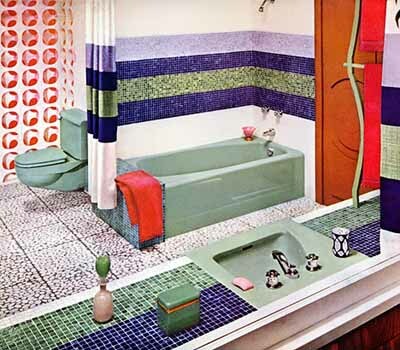 Soft bathroom colors and bright accessories, various textures and exciting themes are associated with retro style ideas for bathroom decorating, inspired by modern in 1950s-60s bathrooms designs. 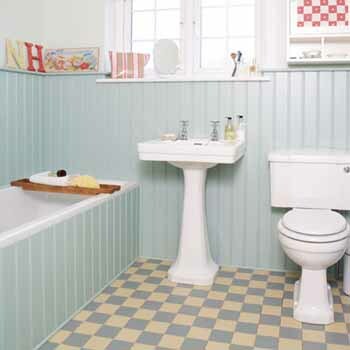 Light bathroom colors, like tender green, pastel pink, turquoise and blue, soft yellow, orange, purple and brown, combined with cream and white color shades, create retro bathroom decorating look. 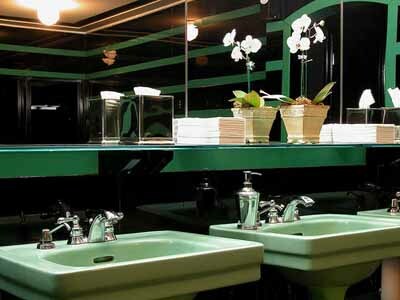 Retro style chrome faucets, sinks and bathtubs with rectangular shapes and rounded edges support retro theme and ideas for your bathroom decorating in 1950s-60s style. 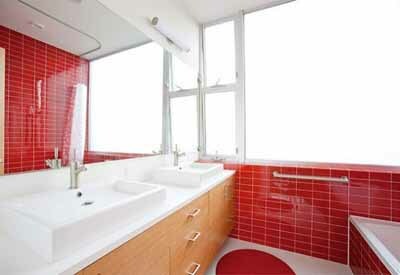 Rectangular bathtubs are great for modern bathrooms in 1950s-60s retro style. Rectangular bathtub creates a clean and simple interior design, which allows to experiment with existing bathroom decor accessories. 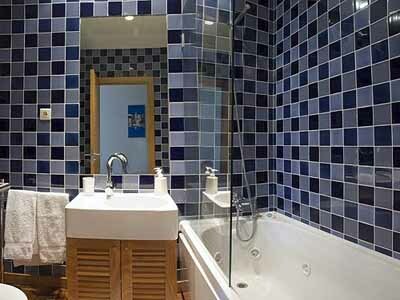 Rectangular bathtubs, installed in a corner or against the wall are space saving solution for small bathrooms designs. 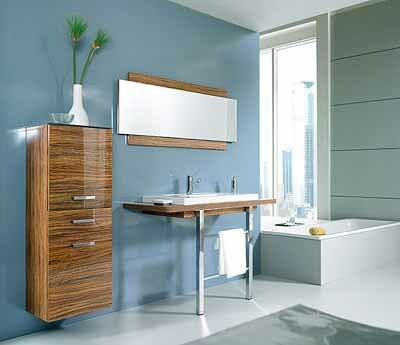 Attractive combination of oak furniture and shelves with varnish and chrome finish bring 1950s and 60s into modern homes, offering bright and relaxing retro style bathroom decorating ideas. Vintage pieces, especially old perfume bottles and glass vases in white, black, deep green, blue, orange, pink and red colors are retro style ideas for bathroom decorating that bring dramatic accents and add unique character to retro-modern bathrooms designs. Retro style bathroom decor accessories give comfy, cheerful and homey feel to modern bathrooms, changing the entire bathroom decorating to retro style with vivid colors, dynamic and playful geometric repetitive patterns. 1950s or 60s magazines pages in wooden or silver colored frames, retro style clock and mirror help modern bathroom decor in retro style look bright, interesting and trendy.